You are currently browsing the category archive for the ‘Stanmore’ category. 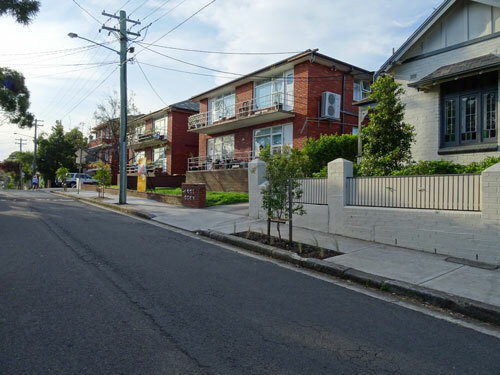 First I noticed Sydney Council was reclaiming the road corners & creating verge gardens. Now Inner West Council is also doing this & I think it is wonderful. I have seen a few of these popping up around Stanmore, Dulwich Hill & Marrickville, though there may be others in suburbs that I have not seen. Claiming back land to green it up will have many benefits for the community. Plants & a street tree will obviously soften the landscape & add beauty. As the tree grows it will create shade, which will lower the urban heat island effect. If it is a native tree, it will provide food for urban wildlife, which should a priority in my mind. Street trees trap particulate matter on their leaves, thereby improving air quality & lowering air pollution levels. The resulting impact of air pollution on the health of people is starting to gain considerable traction amongst the scientific community. Air pollution has a tonne of negative impacts such as higher incidence of respiratory diseases such as asthma, bronchitis & emphysema. Lung capacity & lung function also decreases. There is an increased risk of cancer, especially breast cancer, as well as heart disease in all ages, including more fatal heart attacks. Stroke is another high risk. Air pollution is a threat to child health with lower birth weight & the increased the risk of infection & developmental delays. Alzheimer’s disease & other dementias are the latest significant health issues found to be linked to air pollution. 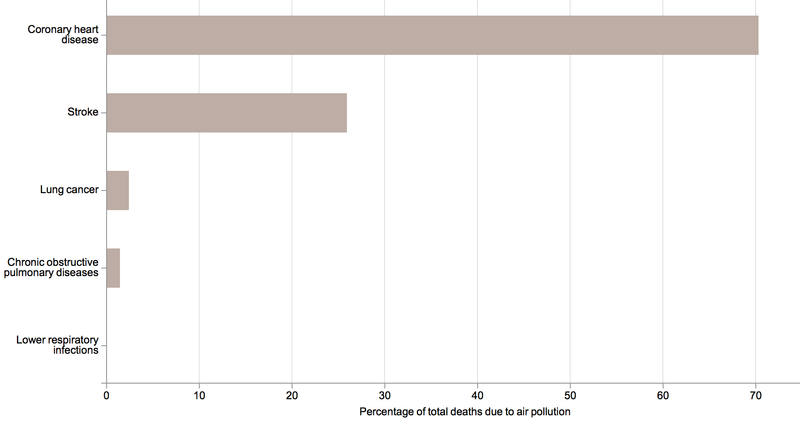 The authorities cannot dismiss air pollution considering the incredible amount of suffering & the costs associated with helping people affected by air pollution. The photos below shows Clarendon Road Stanmore. The corner has extensive work creating a verge garden & a large garden on what was once road. A street tree has also been planted. 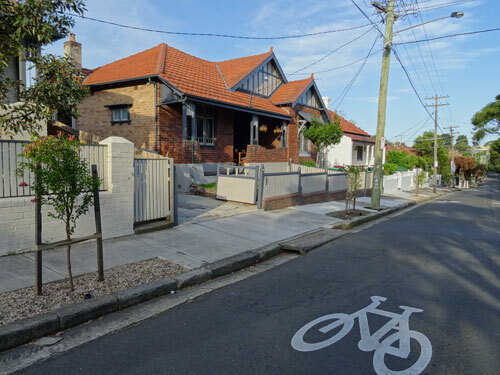 If this is the way of the future for many of our wide roads & expansive corners, it will transform the streetscapes of the former Marrickville municipality. I think it is great that Council has started to use these spaces to add green & trees. They will not impact on driver sight, as clearly demonstrated in neighbouring suburbs that have many more street trees then we do. Another added benefit is that corners given this treatment may slow drivers down. They smaller distance pedestrians need to cover to cross the road should also improve safety. It’s a win for wildlife & a win for the community. Clarendon Road Stanmore has been transformed. The opposite side has a small verge garden. I am pleased to see Council using a variety of native plants. Once grown they could offer habitat for small insects and lizards. The Coral tree for removal is centre of this photo. 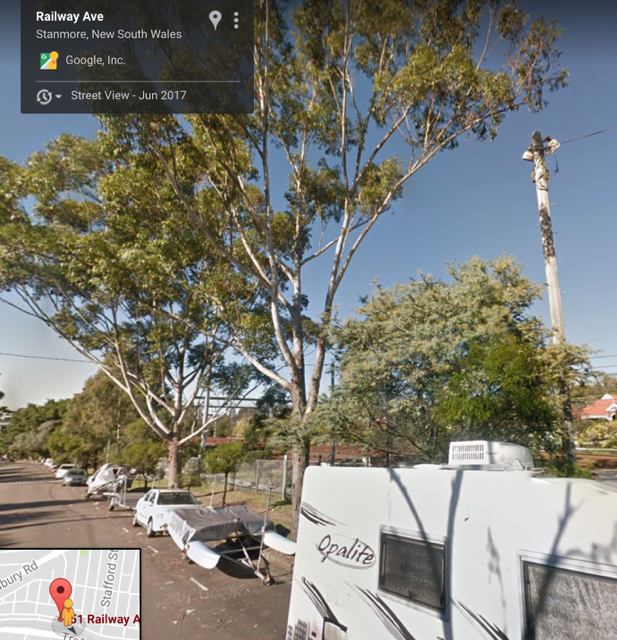 Inner West Council has given notice that they intend to remove a Coral tree (Erythrina × sykesii ) inside Weekley Park, adjacent to 89 Albany Road Stanmore. “Tree has poor vitality and significant canopy dieback. 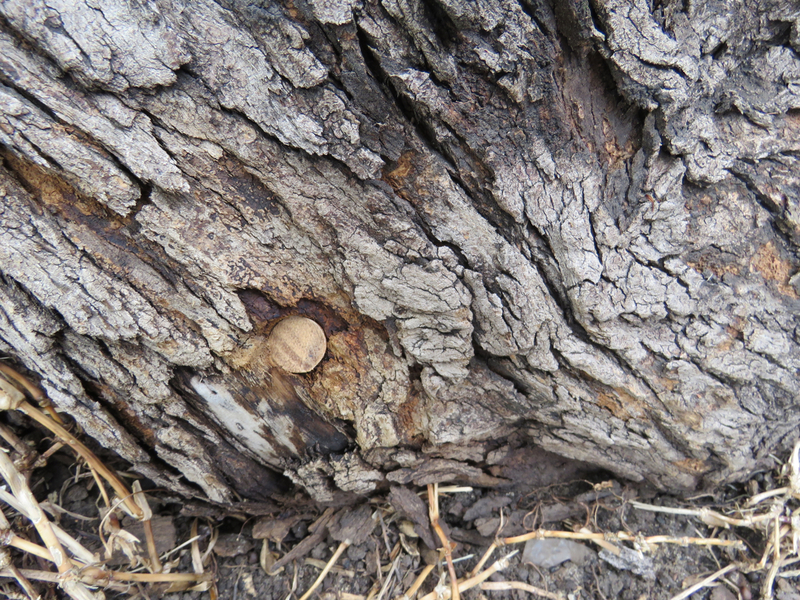 Major open wound to trunk with decay and loss of structural wood. It is regarded as a weed tree in NSW because they can regrow from a fallen branch, a twig or stem or even suckers. Despite this, they can easily be managed in suburban areas as shown by Bayside Council who have classified a number of their old Coral trees as significant & protected. The condition of this Coral tree in Weekley Park is as described by Council. They say they will replace this tree with an Illawarra flame tree (Brachychiton acerifolius) by September 2017. While it is a shame to lose this big old Coral tree, I am pleased that it will be replaced with a native tree that puts on a great colour show & can grow to a significant size. We need big trees. Illawarra flame trees are native to coastal rainforests from central New South Wales to far north Queensland. They are deciduous in winter & produce clusters of vivid red bell-shaped flowers over spring-summer, which provide food for nectar-eating birds, bees & butterflies. Anytime an Illawarra Flame tree is added to the Inner West landscape is a win as far as I am concerned. The deadline for submissions is this Friday 23rd June 2017. It appears that the bark was removed to inspect the tree. You can see that it is not in great shape. Sydney blue gum in Stafford Street Stanmore. It looks like a sick tree with a poor canopy. Unfortunately the canopy does not show well in this photo. A tree behind makes it look fuller than it is. You can see the damage in the trunk of the Sydney blue gum. 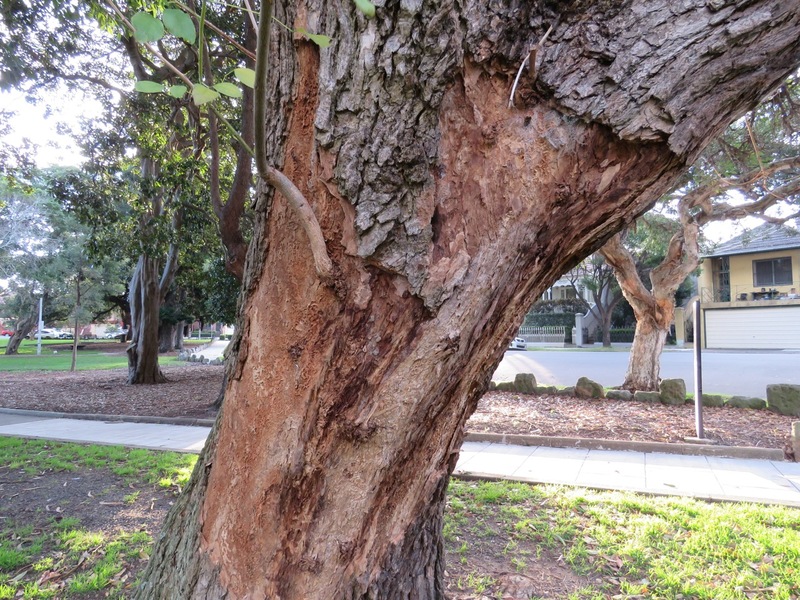 Inner West Council has given notice that they intend to remove two public trees in Stanmore. 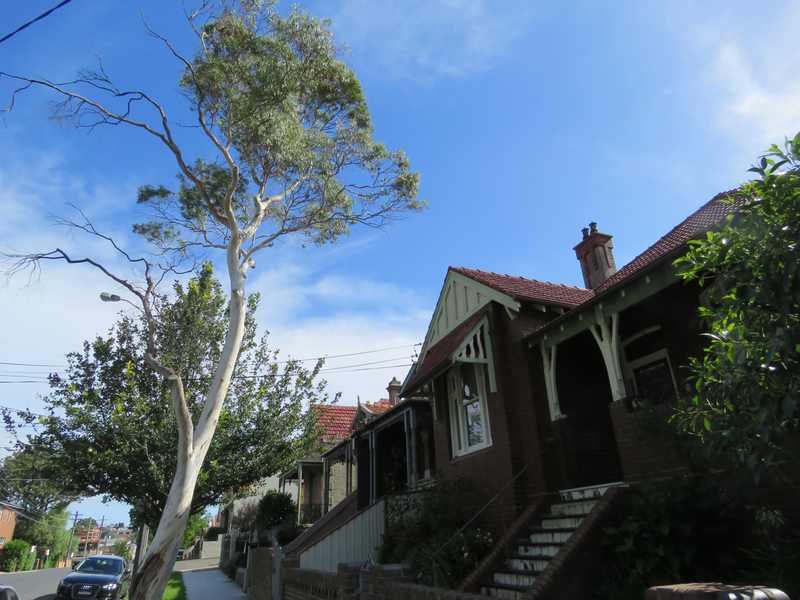 Tree number 1: a Sydney Blue Gum (Eucalyptus saligna) outside 13 Stafford Street Stanmore. 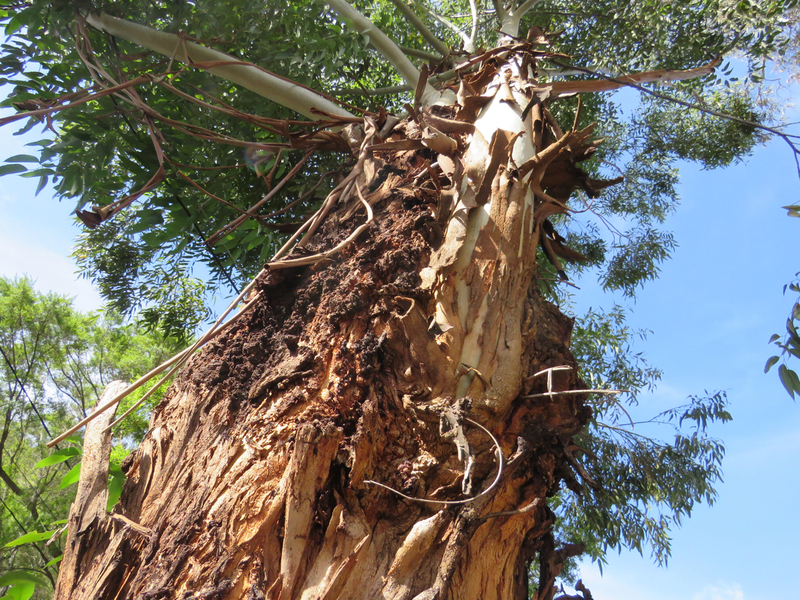 “Tree has previously had several major branch failures which have resulted in weakened structural integrity. Council says they will replace with a Jacaranda (Jacaranda mimosifolia) in the 2017 Street Tree Planting Program between May & September. I agree this tree needs to go. While I like Jacarandas, I think it is a shame to replace a big native tree species with an exotic. The deadline for any submissions is Friday 3rd March 2017. 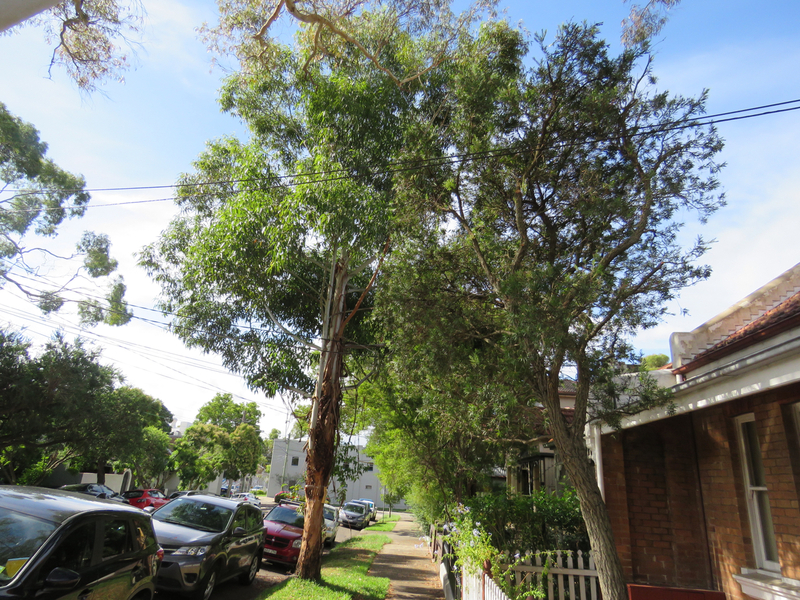 Tree number 2: a Brittle Gum (Eucalyptus mannifera) outside 62 Percival Road Stanmore. Council says they will replace with a Spotted Gum (Corymbia maculata) during the 2017 Street Tree Planting Program between May & September. I agree this tree needs to go & think it is good that Council is replacing a native with a native. The deadline for any submissions is Friday 10th March 2017. Brittle gum in Percival Road. Not much canopy left. 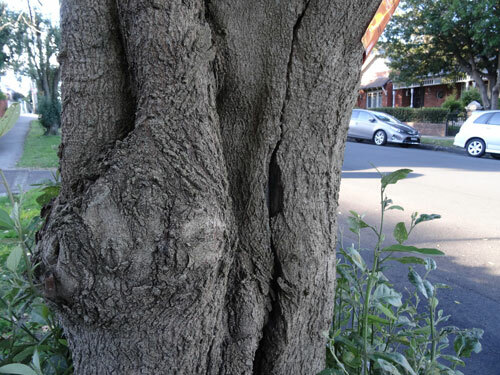 The trunk of the Brittle gum in Percival Road. 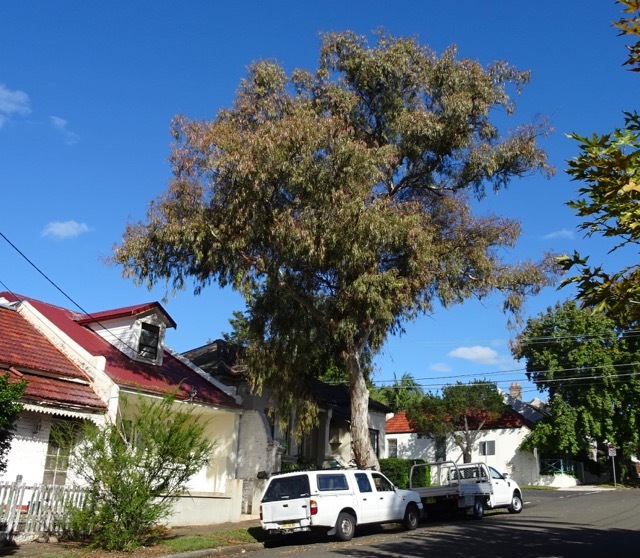 Brittle gum tree to be removed in Durham Street Stanmore – it does lean towards the house. 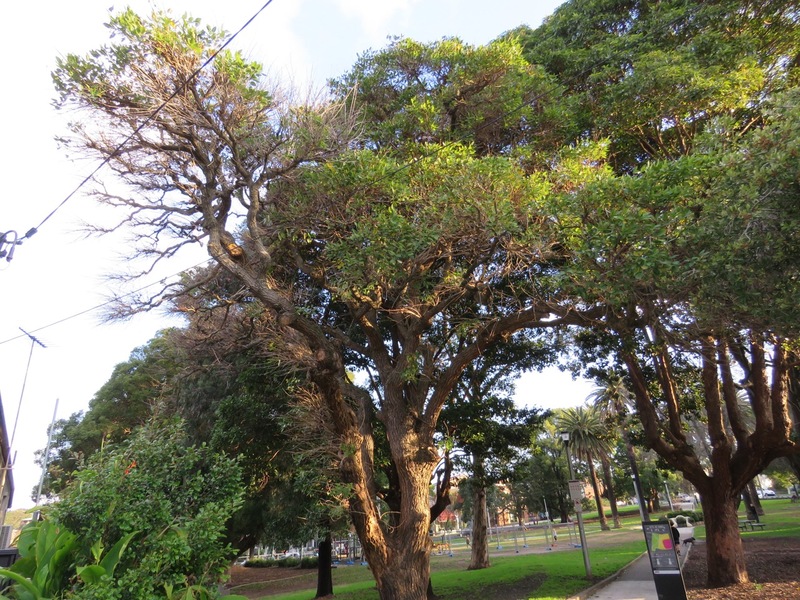 Marrickville Council has given notice of their intention to remove two trees in Stanmore. 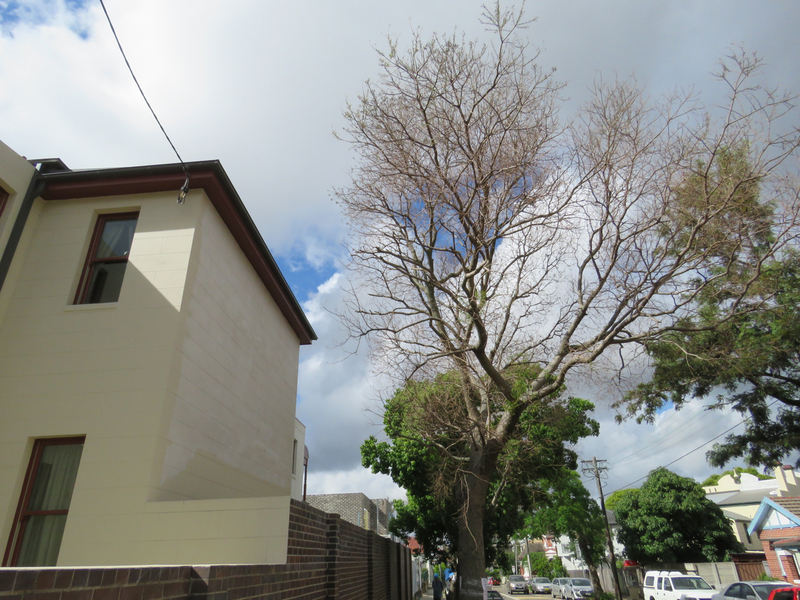 Tree number 1: a Brittle gum (Eucalyptus mannifera) outside 21 Durham Street Stanmore. “Internal decay at base on tension side of lean, causing the tree to be structurally unsound. Identified by 2012 Street Tree Audit for removal. 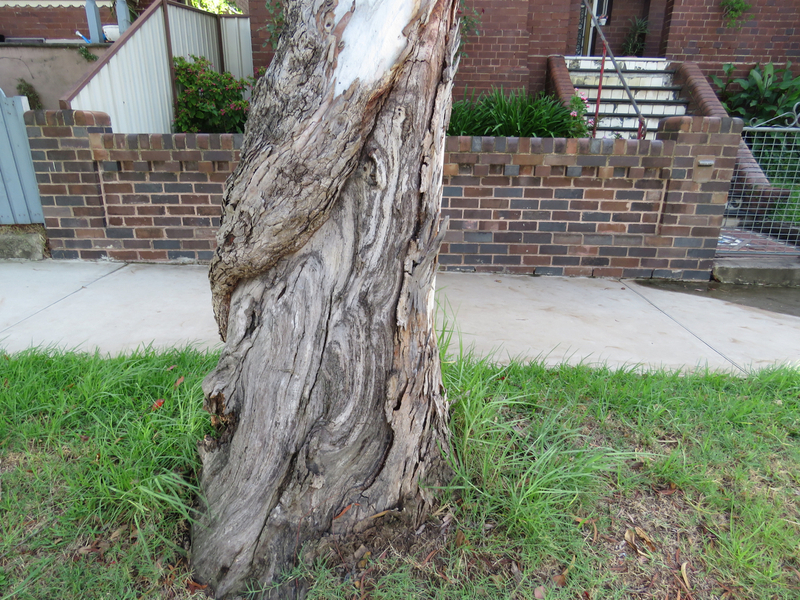 Council says they will replace this tree with a Scribbly Gum (Eucalyptus haemastoma) by September this year. This tree did not have a ‘Notification of Removal’ sign attached. Tree number 2: a Small-leafed Peppermint (Eucalyptus nicholii) outside 48. 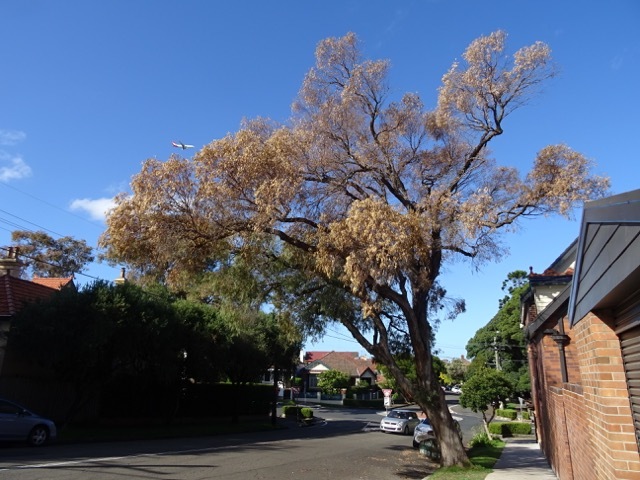 Council says they will replace this tree with a Brush Box (Lophostemon confertus) by September this year. This tree did not have a ‘Notification of Removal’ sign attached either. The deadline for submissions for both trees is Friday 6th May 2016. 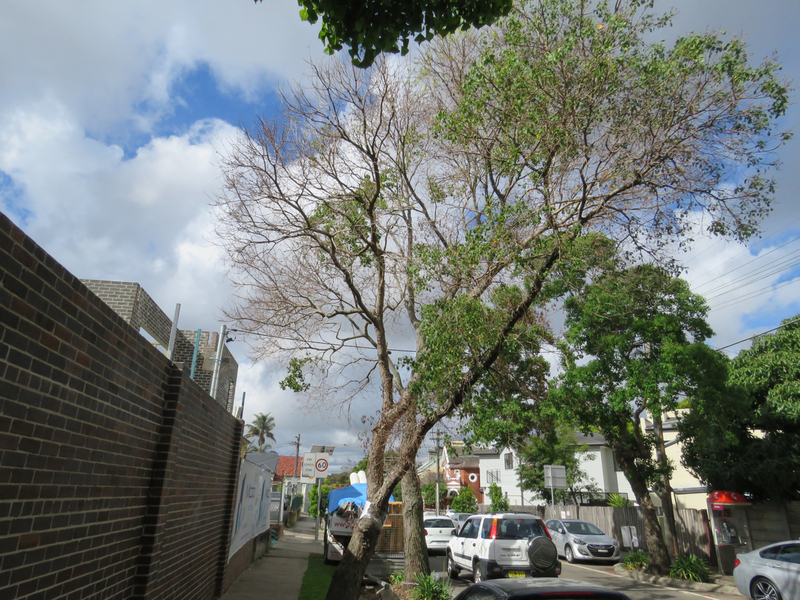 Tree to be removed outside Percival Road Stanmore – the dieback is easy to see. My photo does not do this space justice. It feels good to be here. There is a very large Brushbox & a line of Casuarinas that sound great when there is a breeze. There were also lots of birds & the place feels cared for. 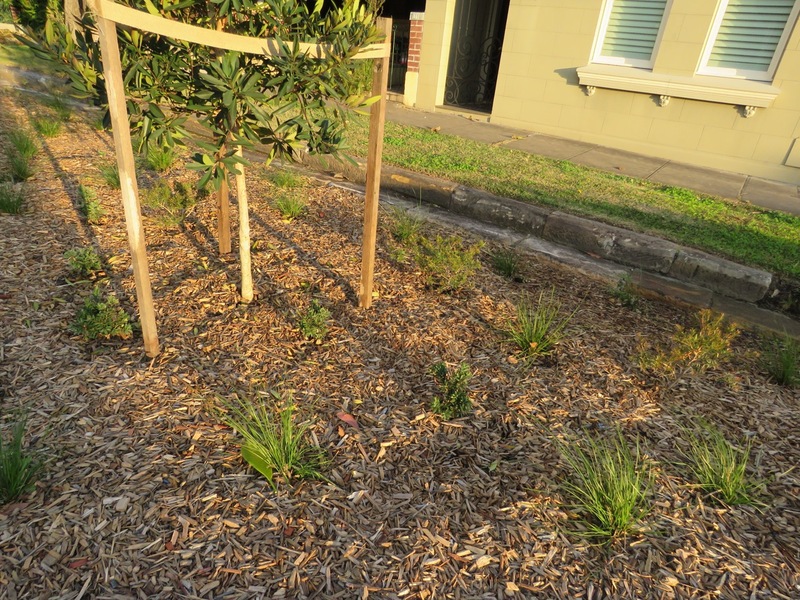 Recently I received an email telling me about what appears to be community planting along the bicycle route in Stanmore, so we took off on our bikes to have a look. The route takes you off Crystal Street, down York Crescent, into a path along the railway line & then out into Gordon Crescent. Then you come into something rare in this municipality – a wide strip of grass lined with mature trees. The space is like a long pocket park. It is here that someone has been busy planting a mix of shrubs along the roadside in-between the lovely stretch of trees & also along the cyclone fence that borders the railway line. Some vines have also been planted along the fence. I always think it is great when I see planting done by the community. Verge gardens interest & often delight me. Most street planting adds beauty as far as I am concerned & shows care toward the environment. This particular work has the potential to create a very nice pocket of green that could double up nicely as a place of respite. It is intermittently noisy around here because of the planes & trains, but cars are few. 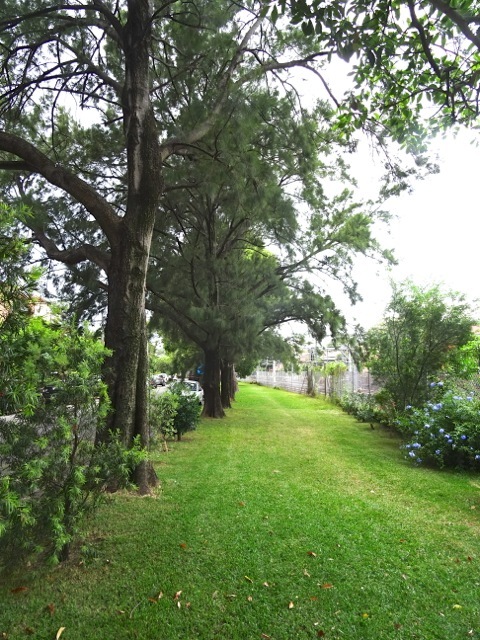 There are many parks in Marrickville LGA that just as noisy. Eventually the vines will screen off the railway line. I can well imagine sitting here reading in the shade of the trees if I lived close by. So I thank whoever is working on this patch knowing that it can be a considerable cost to buy plants & then the effort required to look after them. With all the development due to happen in Marrickville municipality, green spaces like this one will increase in importance. 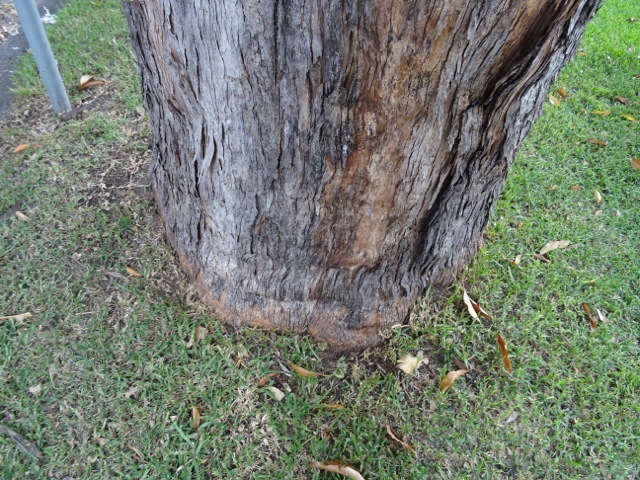 As an extra because it in in the same location – it was sad to see the whipper-snipper damage around the base of this old and grand Queensland Brushbox tree. This tree is slowly being ringbarked. In my opinion, it should be surrounded by some mulch to protect it. New street trees along a great stretch of Newington Road Stanmore. 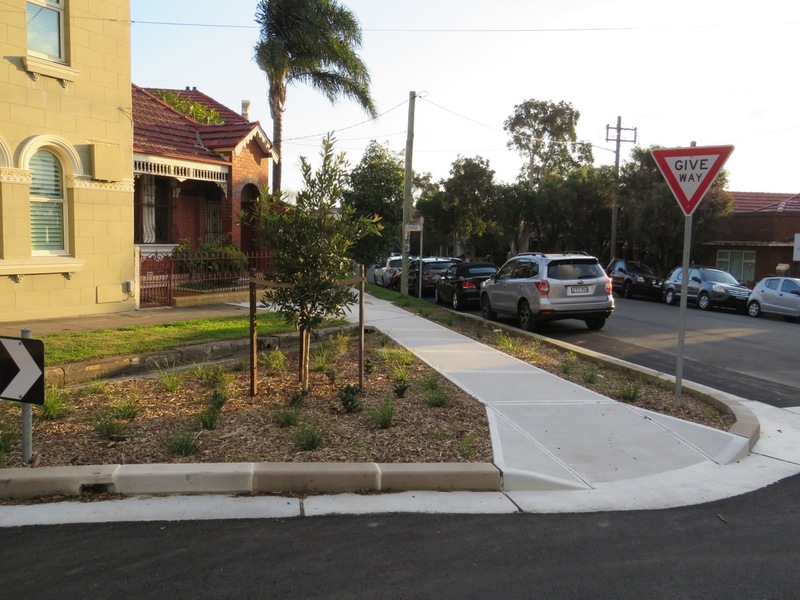 Another view of the newly planted street trees on Newington Road Stanmore. This season of street tree planting was very visible during last weekend’s bicycle ride. There are lots of new trees planted all over the municipality & they look great. Hopefully the vandals will leave them alone. 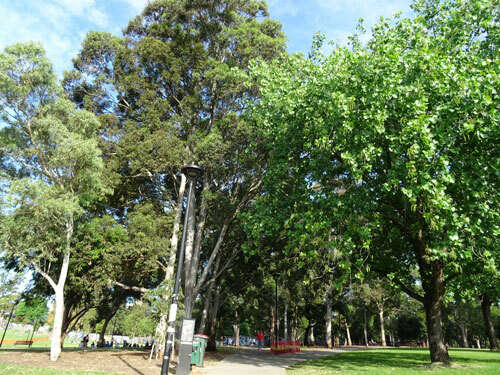 Camperdown Memorial Rest Park has also benefited from this season’s tree planting with many new trees. This park, particularly the section the runs alongside Australia Street & between the wall of St Stephen’s Church, is looking great. There are lots of tall trees here providing good shade that was being enjoyed by many groups of people. This used to be a park with not much accessible shade, so it is great to see this change. It clearly shows the impact of tree planting & how trees & shade can improve the usability of a park, plus add significant beauty. I think this section in Camperdown Memorial Rest Park looks gorgeous. What is great is that even more trees have been planted in and near this area of trees. 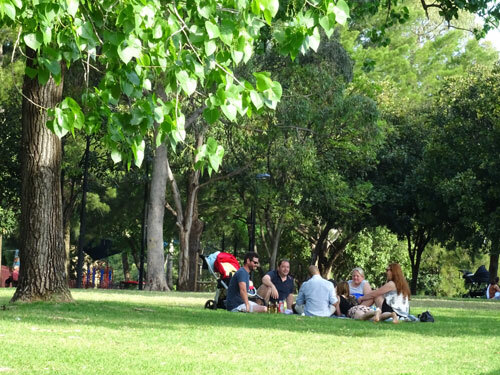 People enjoying the shade in Camperdown Memorial Rest Park. There were many groups doing exactly this in other areas of shade. 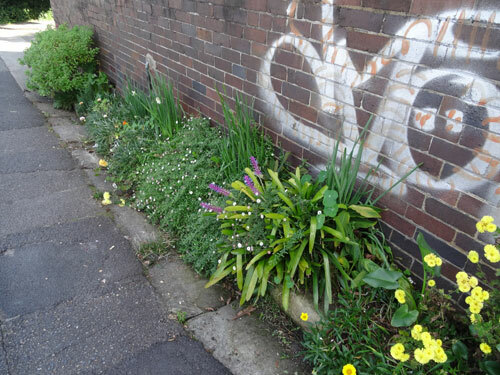 Around 40 metres of tiny verge has been planted with a range of plants. Many of them flower & many of them are easily propagated or grown from seed. 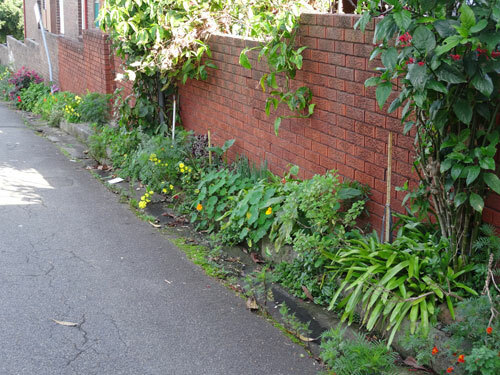 A number people have suggested I visit Alma Avenue in Stanmore to have a look at the verge gardens there. I recently did & what I saw was a nice surprise. Alma Avenue is one-way. 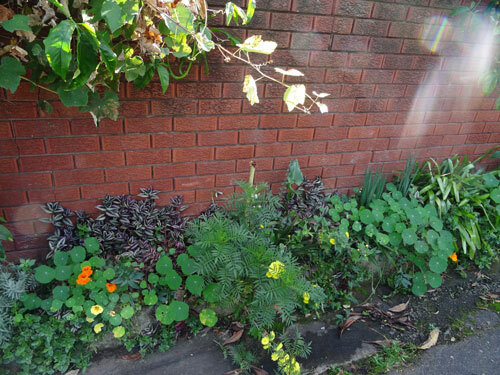 There is no room for a footpath here, but despite the gardening limitations, a resident has created something quite beautiful – a burst of colour & richness in a tiny verge between the house & the kerb. There are numerous examples of other places just like this all around the municipality & most are left untouched. They tend to be magnets for weeds & litter. Some are concreted. Looking at the work done here I understood why so many people had spoken to me about this verge garden. I thank whoever created this, as it brings much beauty to this street. Imagine if all spaces, big or small, were planted out – how nicer it would look. Another section. Pity about the tagging. Mature Norfolk Island hibiscus to be removed. 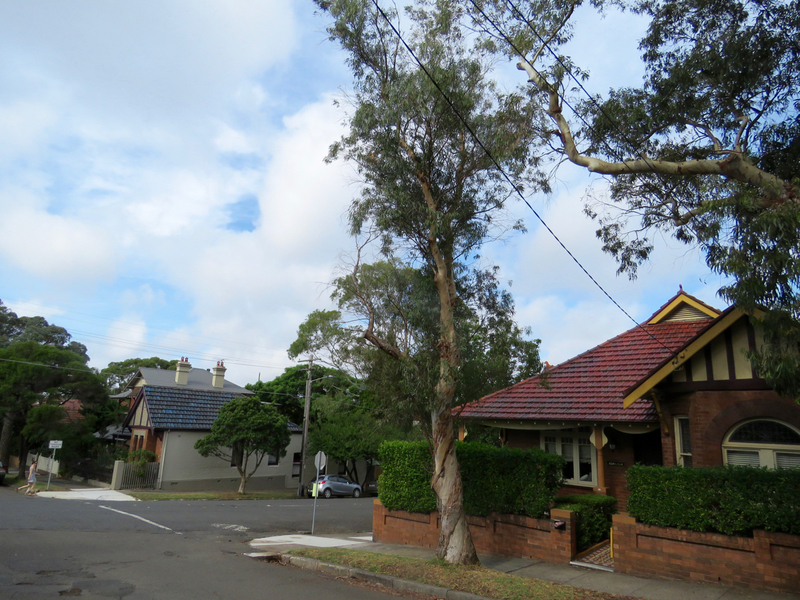 These two trees one house down fr the tree to be removed have been recently pruned. They are also Norfolk Island hibiscus. 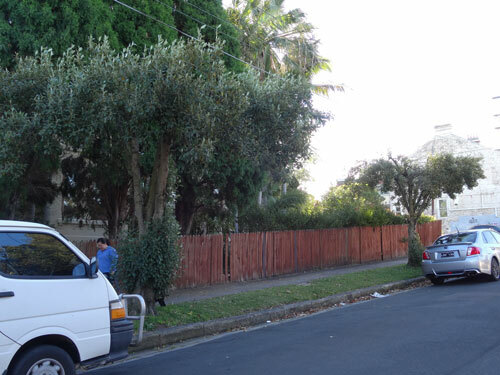 Marrickville Council has given notification of their intention to remove a Norfolk Island hibiscus (Lagunaria patersonia) outside 46 Bruce Street Stanmore. Active split in main trunk. The tree is heavily impacted by clearance pruning for powerlines. There is a split in the trunk & visible decay. 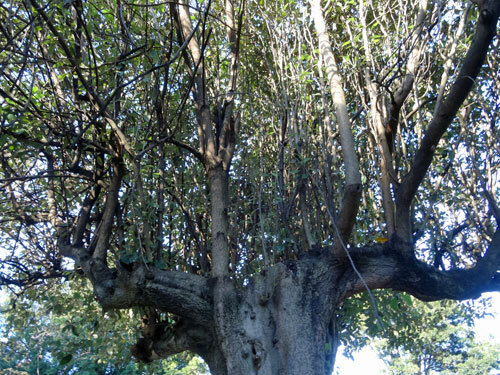 The canopy is full of epicormic growth as a result of pruning for the overhead power lines. Two other Norfolk Island hibiscus street trees one house along have been severely pruned. I expect that these two will be removed in time. Norfolk Island hibiscus grows to 12-20 metres high, so is entirely an inappropriate choice for under power lines. 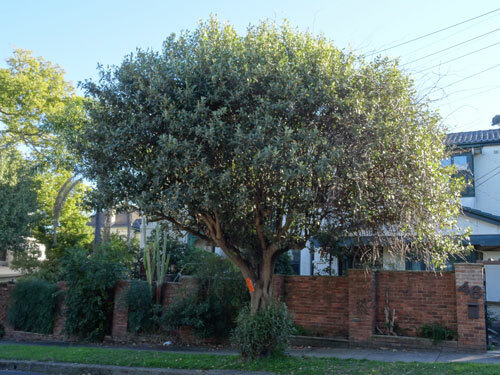 Council say they will replace this tree with a Mock Orange (Murraya paniculata) in the current 2014 Street Tree Planting Program. Mock orange (Murraya paniculata) is native to southern China, Taiwan, the Indian sub-continent, SE Asia & northern Australia. It is usually used as a hedge & grows to between 4-12 metres in height. Mock Orange (Murraya paniculata) is very similar to the cultivated exotic form of mock orange (Murraya paniculata ‘Exotica’), which is regarded as an environmental weed in NSW & QLD & a potential environmental weed in the Sydney region. Professional nursery growers are using a ‘cutting grown selection,’ which produces little or no berries. The growth habit is more compact. The deadline for submissions is Friday 11th July 2014. I will not be putting in a submission. I have not seen a canopy that is mostly epicormic growth. The tree looks as though it was once topped.